Your community can achieve a Tree City USA Growth Award if it qualifies as a Tree City USA for at least the second consecutive year and completes activities in eligible categories totaling 10 or more points. Eligible activities fall into one of four categories, and each activity has an associated point value. 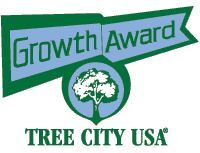 Complete your Growth Award application using the same online Tree City USA portal you use to submit your annual Tree City USA application or download the Growth Award Application below. star Communities that earn the Growth Award for ten years receive special Sterling Tree City USA Designation.